I wrote this blog in 2008, when the Glasshopper was born. Reposting the same here, as I continue to blog on my own website. This was really the first public appearance of Glasshopper to showcase its original tiffany style stained glass. Perhaps you know the story of Michelangelo, to whom a painting was brought by a young painter for his comment. Michelangelo merely changed the shape of the eyebrows and eyes. This radically changed the portrait. Said the painter, “You made so small changes.” Exclaimed Michelangelo,” Small things make the difference.” Against the backdrop of Architecture, stained glass may appear a small thing that if captured colours, it adds grace to the architecture and changes the aura and the internal vibrations of the Vastu. Started by Tiffany, it is now accepted by all those who want to beautify their homes – without making it look gaudy. Those who want to beautify their homes by just doing small things are now turning to the use of Stained glass. It can be on any one of the windows, entrance doors, kitchen or ceiling to imbues the Vastu with soothing colours. 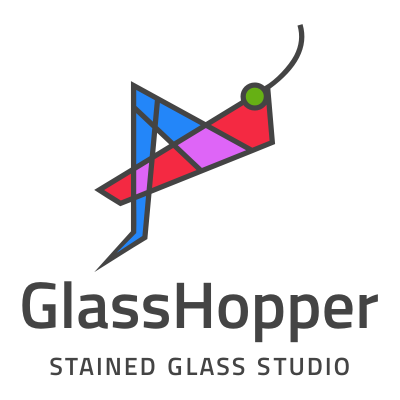 May I invite you at Glasshopper’s to witness our effort in stained glass work? Little gift ideas in stained glass to beautiful and unique lamps, something unusual and unique out of scraps to large window panels, glass panels, cabinets and huge lanterns. Please come. Let us exchange ideas on how we can be creative in our own way. My medium is glass… let us find yours. 10.30 a.m. – 8.30 p.m.